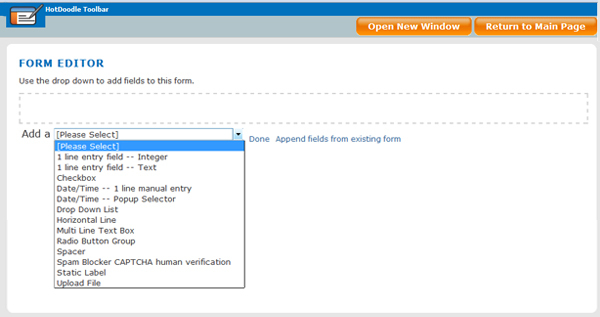 There are many field options when creating a form for a website in HotDoodle. 1 line entry field -- Integer - This field option is 1 line that only allows numbers. 1 line entry field -- Text - This field option is 1 line with any text, numbers, and punctuation. Checkbox - This field option lists items with a checkbox. Date/Time -- 1 line manual entry - This field option creates a series of drop down menus for a visitor to select a date and time. Date/Time -- Popup Selector - This field options displays a popup calendar for date and time selector. Drop Down List - This field options creates a drop down menu of options. Horizontal Line - This option places a horizontal line between form fields. Multi Line Text Box - This field option creates a text box that the number of lines can be specified for. Radio Button Group - This field option creates a list of items each with a clickable radio button. Spacer - This option places a space between fields on the form. Spam Blocker CAPTCHA human verification - This field option displays a human verification test where the visitor will have to enter the text they see displayed. Static Label - This option allows the insertion of a label or expaination within the form fields. Can be used to create headings when a form contains multiple sections. Upload File - This field option displays an "Upload File" button and allows the visitor to attach a file to the form submission.